Use the same weight for all exercises. Prescribed weight is: Female = 65 lbs. Male = 95 lbs. Use weight you have been using. Previous time = 10:33 with 95 lbs. Did this on shift Tuesday 8/25/09. Climbed 29 floors (Wells Fargo Building) fully turned out with a bottle on (approx. 65 - 70 lbs). Then did 5 Burpee's fully turned out. Then went and played 2 full court basketball games. Helped a few homeless people and then did Thursday 8/27/09 Workout. It was hard and my legs were toast but was still able to beat my previous time. I am amazed at everyone's times. Should have used 55#,Was not up to speed with Jen this time. Stayed with same wieght, and bet my last time. And NO I didn't miss a around!!! And even if I did, it wouldn't have taken me 9mins to do 1 more round!!! Mike L, was watching my BACK SIDE Ha! Ha! great job Mike L. We where very close in timing the last time. 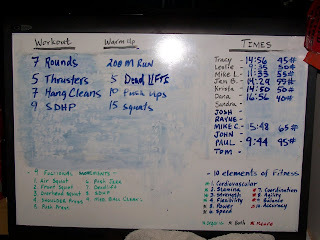 This workout still SUCKED the secound time around! !